- 1.Wash and dry hands to remove oils and dirt. - 2.Clean the iPad and screen with wet and dry wipes. - 3.Grasp the Set 1 Tab to remove the protective film layer. Do not touch the adhesive side once the protective film layer is removed. - 4.Ensure that the adhesive side of the screen protector is facing down. With your fingertips, carefully hold the two tabs on either end of the screen protector. - 5.Using the tabs, carefully align the screen protector with tablet. Now, slowly lower the screen protector onto your device. - 6.Once the screen protector is in place, lightly press the center of the screen protector and then gently slide your fingertip across the screen, allowing the screen protector to adhere itself to the tablet. - 7.Eliminate any bubbles by using the included Squeeze Card to push bubbles out. - 8.Finally, hold one of the two tabs and slowly peel back the second protective plastic film. 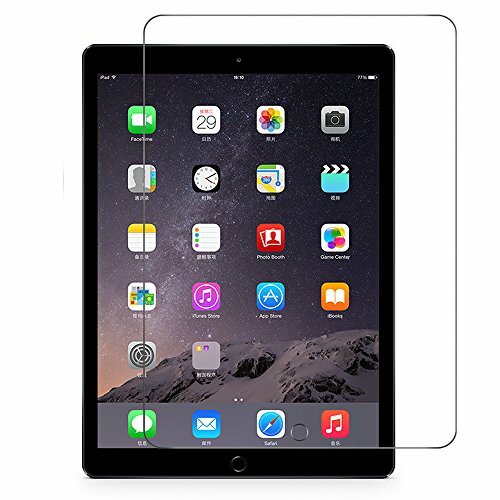 COMPATIBLE MODELS: RUBAN Tempered Glass Screen Protector is designed specially for New iPad 9.7 2018, iPad 9.7 2017,iPad Pro 9.7", iPad Air 2 and iPad Air.Compatible iPad Model Numbers: A1474/ A1475/ A1476/ A1566/ A1567/ A1673/ A1674/ A1675/ A1822/ A1823/ A1893/ A1954.No interference to the sensitivity of Apple Pencil and Multi-Touch subsystem. EASY INSTALLATION: Automatically attach to the iPad screen smoothly.With simple instruction, the installation is hassle-free and bubble-free. No residue when removed. Rounded edges fit the screen better within case. DOUBLE DEFENCE TECHNOLOGY: The reinforced glass doubles the strength of non-tempered alternatives. Made with superior 9H tempered glass that protects your screen from scratches and high impact drops. The Oleophobic Anti-Fingerprint Coating screen protector keeps your screen free of fingerprints and oily smudges and is easy to clean. HIGH TRANSPARENCY & RESPONSIVE: As thin as 0.33mm, RUBAN Tempered Glass Screen Protector not only provides 99% HD clarity but also maintains iPad's original response sensitivity and touch feeling. PACKAGE INCLUDES: 1 RUBAN Tempered-Glass Screen Protector, 1 alcohol wipe, microfiber cloth, 1 dust removal sticker, bubble removal card, installation instruction. If you have any questions about this product by RUBAN, contact us by completing and submitting the form below. If you are looking for a specif part number, please include it with your message.